Farmer Peter Leahy, one of our beef producers, comes from one of the oldest farming families in Ontario. His family has been farming in the Lakefield area for the past 200 years. Today, he runs Merrylynd Farm, a fully organic and GMO-free farm and mill in Lakefield, Ontario. Peter has been growing organic grains and producing organic beef and chicken since 1998. He made the switch to organics because he believes it makes good sense for the environment and for the community. Peter suspects his cattle are truly happy, roaming outdoors all year round. In the summer, his herd of Angus Brown cows and bull have their own off-farm holiday at a secluded organic grass pasture to graze and breed. We’ve had a long-standing relationship with Merryland Farms, selling their organic beef for almost a decade and offering a selection of their frozen steaks, roasts, and ground beef. We can vouch for their beef firsthand – we make our Shepherd’s Pie with it. And if you have eaten their stewing beef and wonder how it’s so tender? It’s cut from sirloin steak. Try it and taste the difference from Ontario’s Merrylynd Farms. Charlie Welsh of Scotland, Ontario is one of our asparagus producers. By now, you’re probably craving fresh-from-the-field Ontario vegetables on your plate – and at last, you can have your fix with the first crop of Ontario asparagus. At Reesor’s, we eagerly anticipate the first stalks of asparagus because it kicks off the Ontario growing season, which we always wait for. 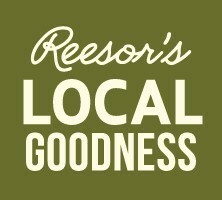 At Reesor Farm in Markham we specialize in growing strawberries, sweet corn, and other vegetables. So we count on farmer Charlie Welsh and other farmers from Norfolk County to grow asparagus for us. Last week Charlie and his partner (and uncle) Peter Welsh harvested their first crop of asparagus, and as he sees with every harvest, the arrival of spring’s first vegetable is greeted with smiles. “When I bring asparagus to market every year, people are very excited. I’m happy to be growing something that people get excited about,” says Charlie. The Welsh family has been growing sweet corn since the 1930s and started growing asparagus in 1989. On the shores of Lake Erie, Norfolk County has been an ideal growing location for asparagus because of its sandy loam soil. Since his father retired in 2007, Charlie has been farming in partnership with his uncle Peter Welsh.